So this is what happens when you’re too over enthusiastic about getting a leg up to bound onto a 7ft giant’s chair in a Leprechaun Museum but you’re neither as limble and light as you once were. 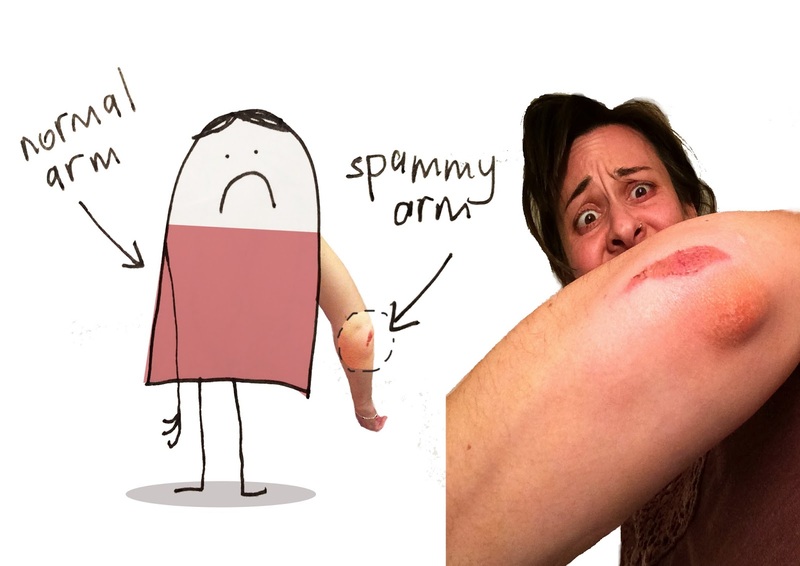 For your perusal, I have attached here an image of myself plus a close up elbow image. You can't quite appreciate it, but the bump is about the size of an egg. And that mouldy yellow smudge isn't that I have a dirty elbow. Thats the beginning of the bruise. I have to say, for a while there I couldn't even see my elbow. It was just one big giant Popeye type swelling. I’ve got injuries now that remind me of scrappings I got as a tiny Thom. You don’t tend to get those type of damages once you grow into a grown up because really, you’re meant to be a little more in control of your body and how you make it work. But unlike those times in primary school when I would tend to bound up and give it another go, I lay on the floor for a good while to make sure things weren’t broken, while everyone else enjoyed bounding onto the chairs in a much more sensible way. Sensible isn’t as fun, but it Goddamn hurts sometimes.